Daily pill reminder to alert you when to take your medication. Extra large compartments can store nearly 100 pills each day, and up to 4 alarm reminders can be set. If you require regular medication, it can be a pain trying to find a pill box that can adequately hold all of your tablets. Often pill boxes are designed for their portability, but are simply not big enough. On the other end of the scale, pill boxes which can hold a higher amount of pills are usually clunky and impractical. The Tabtime 4 strikes a balance between size and practicality. Enough space to hold nearly one hundred pills a day, it will certainly be big enough to meet your medication requirements. At the same time, its sleek design prevent it from being bulky and awkward to carry. This product is also a timer/reminder and will alert you using both a visual and audio alarm when it is time to take your medication. That way you can cross one thing off your mind, knowing the Tabtime 4 has got you covered. How Does the Tabtime 4 Work? The Tabtime 4 consists of four compartments which you can fill up with your tablets, dividing them into the different times of day you need to take them. Each compartment can hold up to twenty-four Aspirin sized tablets, meaning the Tabtime 4 has a holding capacity of nearly one hundred tablets a day. Therefore, if you take multiple tablets, this product will almost certainly be able to meet your needs. 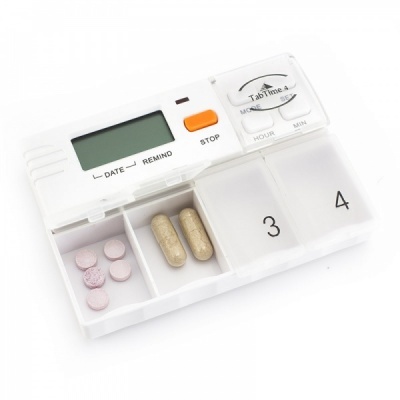 You can set up to four daily alarms so the device will alert you to take your medication. This is particularly useful if your memory is not so sharp, or if you have a busy lifestyle. You can relax a little knowing remembering to take your medication is one less thing you have to worry about. The alarm is both audio and visual, and can ring with excellent volume and flash brightly, making this product suitable for those with either visual or hearing impairments.